Yesterday, while volunteering at a Compassion table at an event, I was sharing with a potential sponsor about the opportunities I have had to travel with Compassion to Mexico and to Colombia. Her initial response..."It must be heartbreaking." I had to think a moment before I replied. Which is exactly what I ended up telling her. But as I was pondering her question a bit more last night, some of these thoughts were whirling around in my head and I just had to write some of them down and share them with you here. Heartbreaking? Yes...because I see how little in material possessions those families need to survive. Heartbreaking? Yes...because I realize how selfish we are. Heartbreaking? Yes...because I stand in my home with all of the modern conveniences and wonder how those moms handle life each and every day. Heartbreaking? Yes...because I wish I could do more to help. Heartbreaking? No...because the smiles on the faces of the children and the many volunteers show me they are not just happy, but they are filled with joy...joy that only come from knowing Jesus. Heartbreaking? No...because I know that many sponsors around the world are making a sacrifice to make a difference in the life of a child. Heartbreaking? No...because these children and their families are hopeful for the future. Being filled with joy and having hope are not things I would associate with heartbreaking...would you? And I would hate for anyone to start sponsoring a child because they felt sorry for them. My hope and prayer is that many people will realize that a small sacrifice on their part makes a big difference for a Compassion sponsored child. 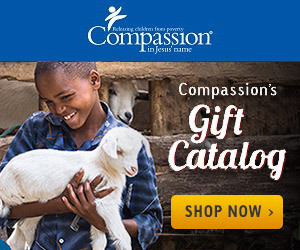 And as a sponsor, not only do you bring joy and hope to the life of a child, but you will be filled with joy and hope as you pray for and encourage the one child God has connected you with through the gift of sponsorship through Compassion.